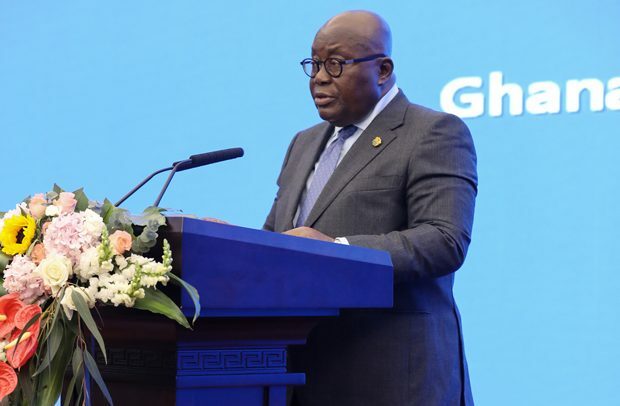 President Akufo-Addo on Wednesday beckoned the business community in China to look no further than Ghana in its quest to invest in Africa. According to the President, Ghana is the best destination for members of the business community on the continent. Speaking at the Ghana-China Investment Forum, on Wednesday, 5th September, 2018 in Shangdong Province, President Akufo-Addo urged the Chinese business community to take advantage of the growing business-friendly climate in the country to invest. “Our flagship agricultural programme, “Planting for Food and Jobs,” our renewable energy sector and ICT growth are all areas of considerable opportunity. These are all sectors you can profitably partner with Ghanaian companies, some of whose representatives have come all the way from Ghana to be here with me,” he said. “Thus far, companies that have established factories in Ghana, under this policy, are importing machinery and equipment duty-free, are not paying import duty on raw materials imported for production, and are enjoying a corporate income tax holiday for five years,” the President added. He indicated that additionally, the Ministry of Trade and Industry has attached two technical experts to provide free advisory services to these companies. Touching on the country’s infrastructural deficit, President Akufo-Addo said his government is embarking on an aggressive public private partnership programme to attract investment in the development of the country’s road and railway infrastructure. “We are hopeful that with solid private sector participation, we can develop a modern railway network with strong production centre linkages and with the potential to connect us to our neighbours to the north, i.e. Burkina Faso, to the west, i.e. Cote d’Ivoire, and to the east, i.e. Togo,” he said. He told the business community that there are several projects in roads, water, housing, transport, industry, manufacturing, agriculture, petroleum and gas, among others, which are being structured to attract private sector financing. President Akufo-Addo urged them to invest in Ghana through the Ghana Investment Promotion Centre (GIPC) or set up Free Zones enterprises. “Regardless of where the investment is, government has instituted a number of incentives for the investor, depending on the nature of the activity or the location of the investment,” the President added. These incentives, he said, include exemption from payment of import duty for plant and machinery; 25 per cent tax rebate for companies located in regional capitals; 50 per cent tax rebate for companies investing outside regional capitals in the regions and 0% corporate tax for 10 years and thereafter 8% for companies in the Free Zones enclave. President Akufo-Addo further told the Chinese that “in future, when you are deciding to invest in any part of the world, certainly in Africa, Ghana should be your preferred investment destination. “As I have said, we are keen on establishing a business-friendly economy to attract foreign direct investments to exploit our country’s great potential on mutually satisfactory terms.